Parent Trust equips parents and families with the knowledge, tools and confidence to raise their children to be safe, healthy, and strong. From conception to college, Parent Trust provides a continuum of research-based and outcome-informed programs and services. serving Washington families since 1978. Parent Trust knows that raising children is hard work, even in the best of times. To help families succeed, we serve more than 15,000 individuals each year with a broad continuum of programs and services that serve Washington State children, youth and families from conception to college. We are are not cookie cutter, "one size fits all" kind of organization. Our staff is expertly trained to work with families where they're at, tailoring our services to meet their individual needs. We achieve child abuse and neglect prevention by working with the whole family. Our parent education and family support programs bring help, hope and strength to parents, caregivers, children, and teens. Whether it's with telephone coaching, parenting and fathering classes, on-line resources, books and training videos, drop-in help, support groups for parents and children, Parent Trust is there in all stages of family development. Would you recommend Parent Trust for Washington Children? I have been a proud board member for the past 2 years and am so amazed with what I see the staff of PTWC do to build resiliency in fragile at-risk parents. This organization fills a much needed gap for building parenting skills to those in need. Parent Trust does fantastic work in our communities to build strong, healthy families. 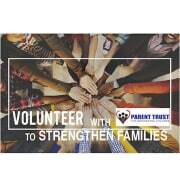 The employees at Parent Trust are a joy to work with, and any opportunity to volunteer is worthwhile. Volunteering with this organization gives you the opportunity to make a difference in the lives of many people in the state of Washington.